Grape varietal originally from neighbouring Canton Vallis (Switzerland). A lot of minerality, elegance and fruit. 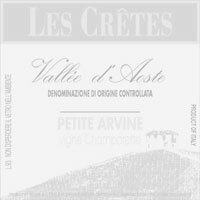 Costantino Charrere, owner of Les Cretes, is still the leading winemaking personality in Valle d'Aosta. He poures all his passion into producing excellent wines year after year, with the sole aim of high quality. His great Chardonnay Cuvee Bois got the yearly Three Glasses award from Gambero Rosso for the seventh time!